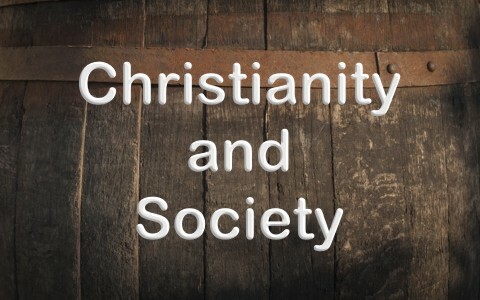 Many non-believers criticize Christianity for being bad for society. Is this true? After the fall of mankind in the Garden, Adam and Eve were kicked out because if they had taken from the Tree of Life, they would have been in a perpetual state of sinning while also having eternal life. We can only imagine how bad mankind would have grown over the years, perhaps growing more evil generation after generation, until it would even be worse than in the days of Noah where “the earth was corrupt in God’s sight, and the earth was filled with violence. And God saw the earth, and behold, it was corrupt, for all flesh had corrupted their way on the earth” (Gen 6:11-12). If you think violence is bad these days, and it most certainly is, just think about how bad mankind would have been by now if left unchecked by death, however, since the wages of sin is death (Rom 6:23), and all have sinned and fallen short of God’s glory (Rom 3:23), we don’t have to worry about that because God removed the possibility for eternal life after the fall as Adam and Eve were banned from the Garden. Even with this, it wasn’t long before “the earth is filled with violence” (Gen 6:13), because “The Lord saw that the wickedness of man was great in the earth, and that every intention of the thoughts of his heart was only evil continually. And the Lord regretted that he had made man on the earth, and it grieved him to his heart” (Gen 6:5-6). We can conclude that without God in mankind’s life, we would grow more and more evil, and society would be so dangerous today that only the strong would survive and the weak and poor would be destroyed. The Bible is a story of the restoration of the fall of mankind and the restoring of our relationship with God through the redemption that Jesus Christ brought with His sinless life, suffering, death, and resurrection. There has never been any one Man in history Who has so impacted history that we can call it “His-story.” Indeed, there has never been any Person that has been more influential than Jesus Christ, the Son of God. This God-Man has had more written about Him and His followers than any other single figure in human history. It’s not even close. Jesus and Christianity have left an indelible mark on humanity and humanity has never been the same. In fact, He changes history through “His-story.” That is an indisputable fact. Try to find any other person in history that has ever been written about more than Jesus Christ and you’ll find that this person’s account pales in comparison to the global impact that Jesus Christ brought. No one else is even close. I have examined every faith or belief system in the world (that I know of) and the person behind that belief system, from the Druids to the Wiccans, to Buddhist to Muslims; clearly, no other religion or person has had a greater impact on the world than Jesus Christ and Christianity. Jesus Christ is the most written about Person in all of human history. More authors have written about Him than a combination of the next ten most prominent people in history. William Wilberforce may have been the single, most influential man in history on the elimination of slavery but his striving to rid the world of this evil was influenced by the teachings of the Bible and of Jesus Christ. He was more influenced by the Bible than by his own conscience and that motivated him to strive to end the slave trade that had become such a global menace. The role of women was drastically changed under Jesus Christ’s teachings and that’s found in the New Testament. Rather than most societies seeing women as nothing more than property, Jesus Christ spoke openly with women and treated them equally before Him. In the Roman world, the Greek world, in the Muslim world, and even in the Jewish culture, women were so degraded that they were not allowed to speak to men. They could be divorced for simply burning dinner. Men had such dominance over women that they couldn’t even testify on their own behalf or in a court of law because their testimony was considered invalid. Jesus Christ lifted the role of women to its proper place; that of equality with men and held women in high regard, unlike those in the society in which He lived. Where most of the known world held women at a level close to their slaves or livestock, Jesus showed respect and attention to women. Even the first two witnesses of Jesus’ resurrection were women. The Bible teaches that women are co-equals and co-heirs before God because “There is neither Jew nor Greek, there is neither slave nor free, there is no male and female, for you are all one in Christ Jesus” (Gal 3:28), so even slaves were deemed to be on equal footing with others in the world. As they say, the foot of the cross is level ground upon which we all stand; none are higher and none are lower. If someone tries to tell you that Christians murdered millions of people (like during the Crusades), you can agree with them that, “Yes, they were guilty,” but even the Crusades were a response to an Islamic empire that allowed no religious freedom and murdered any who resisted being assimilated into the Islamic faith. In fact, the overwhelming majority of crimes against humanity were brought about by atheistic nations that held power and were so violent and gruesome that, according to historical records, more people have been murdered by atheistic communism than any other form of government or group of people. Christians have been the ones who have tried to save lives by hiding runaway slaves, fighting for the unborn, hiding Jews from the genocide, and setting up hospitals to care for the dead and dying that no one else even cared about helping, so no one or no group has ever approached the benevolence shown to societies around the world and in history than Christianity has. Something more to read: What Sets Christianity Apart?